It is surprising how God works within each of us to gently guide us towards transformation. While there are always tremendous mile markers; the loss of a job, a graduation or maybe the sudden loss of a loved one, if we look carefully we will realize God is usually quietly doing his work day by day. Woman Holding a Balance, 1664, Johannes Vermeer 1632-1675, oil on canvas, 15 5/8 x 14 inches, Widener Collection-National Gallery of Art Washington D.C.
As you look at all the luminous details of this painting, think about the elements of your own life that you treasure. Music from the Los Angeles Guitar Quartet on Spotify:) Think about how your priorities have changed through the years. Things that you once thought were important have somehow drifted away…. 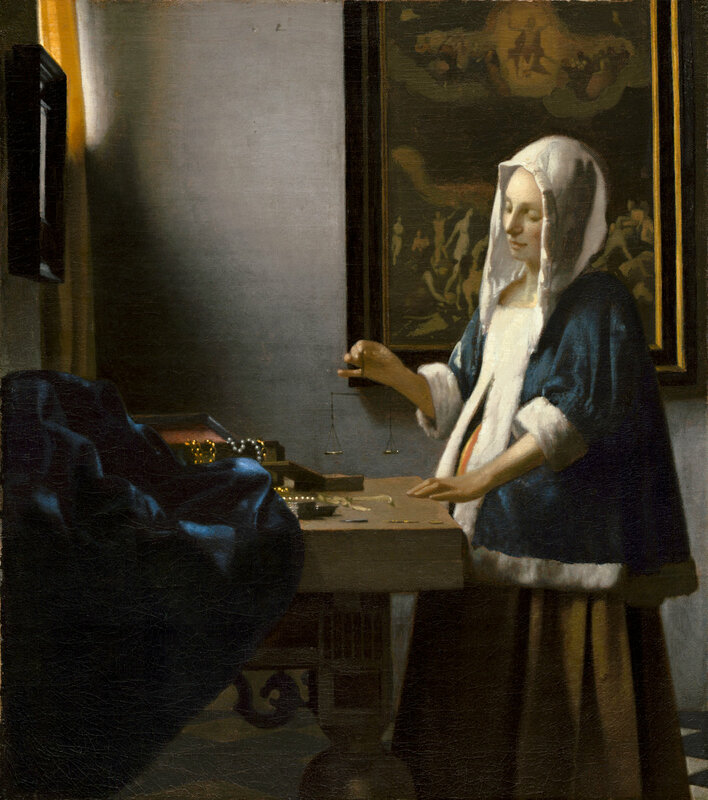 Notice carefully how Vermeer captures this moment in time…this moment of sacred beauty. If you doubt his meaning, notice carefully the painting on the wall behind the young woman’s head. It is Jesus as he weigh’s our souls in “The Balance.” So this week as you balance all your activities, take a moment to trace the outline of your soul’s journey. Can you remember your own flashes of epiphany? Again, how has your growing knowledge of Jesus transformed your heart over the years? Wow! how had I always missed that passage:) May peace and light fill your days this week. For more on Vermeer watch this short video. http://www.youtube.com/watch?v=9kfeWpLry3U And if you want to have a full meal of Vermeer, I stumbled into a treasure trove of short little videos created by the National Gallery. Enjoy! Vermeer’s attention to detail takes my breath away then fills me with a fresh breeze of the Spirit. Thanks for the reflection. Blessings:) We must be kindred spirits. Thanks for reading and commenting! It is the little things that count, and when you add them up they make a whole. I think that Vermeer’s paintings leave me with that message.